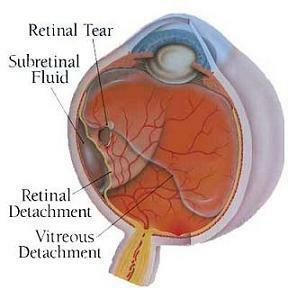 Retinal detachment is an eye disorder which can cause permanent blindness if not treated quickly. It happens when your retina peels away from the back of your eye, like wallpaper peeling away from a wall. Retina contains light-sensitive tissues. These tissues work like the film in a camera. When light falls on these tissues, they generate nerve impulses and send them to the brain which assimilates them and then interprets the information into a image. In short, without the retina, no image signal can be sent to the brain and blindness occurs. Normally, a healthy retina is securely attached to the back of the eye. Occasionally, eye injury, trauma to the head, posterior vitreous detachment (PVD) or overstretching of the retina due to elongated eyeball (severe nearsightedness) may cause a tear or hole in the retina. When the vitreous humor enters the opening, it lifts the retina off and creates separation between the retina and the choroid. Thus causing the retina to slowly peel away from the choroid, similar to air bubbles beneath wallpaper. Not long ago, my mother had a series of flashes and blackout. When we rushed her to the eye doctor, they stated that it may be RD and had to observe her for a few more days. Thankfully, nothing happened. Early treatment of retinal detachment can save your vision. Getting to the doctor ASAP is crucial any of the symptoms above happen. Most people with retinal detachment will require surgery to reattach the retina. If there isn’t any detachment, laser can be used to seal the opening. For small detachment, doctor might insert gas bubbles into vitreous position of your eye instead. As air bubbles float, they push the retina back to its original place. The tear is then seal with laser. Scleral buckling - one or several silicon plastic band is sewn to the sclera (white of the eyeball), pushing the wall of the eye inward against the retina, allowing the retina to reattach. The scleral buckle is very small and not visible after surgery. The side effect of this procedure is that it increases your nearsightedness. Vitrectomy - involves remove the vitreous humor and replacing it with dense fluid or gas to smooth the retina into place. Even though this procedure will not increase your nearsightedness, it increases your risk of getting cataracts. Sometimes retinal detachment may occur suddenly but do not panic. Below are some steps which you can take to avoid worsen the condition. Have someone take you to eye doctor immediately but carefully. Control blood sugar carefully if you have diabetes. Do a prompt and thorough examination ASAP (within 24 hours) if you noticed new symptoms such as sudden increase of floaters, flashes or shower of spots. If you are doing aggressive sports (such as basketball or football) , wear protective eye wear to prevent trauma to the eye or head.